Saying goodbye is hard. In any case, you want to do this in an appropriate way. Forming your own funeral procession to go to church, cemetery or crematorium together with your immediate family can also give you a feeling of consolation and solidarity in a day that brings sorrow. 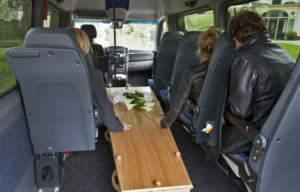 Werotax has years of experience when it comes to making available funeral transportation en follow cars with drivers. You have the choice of anthracite, gray and black follow cars, if desired also follow buses. We employ a number of drivers who are specialized in performing the funeral transport in an appropriate manner, in a very respectful manner. It is possible on the day of the funeral to have the follow cars at your house. Our Mercedes bus offers you, as relatives, even the possibility to accompany the dear deceased on the last trip to church, cemetery or crematorium.